Click to enlarge illustrations if needed. I am very happy that we have arrived at Romans 13:11 because what Paul states here is the source of much misunderstanding in our day. As a pastor, I have said it: “We were saved, are being saved, and will be completely saved.” What was I thinking when I used to say things like that? I really don’t know. But isn’t that what Paul is saying here in Romans 13:11? The Australian forum used these illustrations to convince the church that the true gospel of the Reformation had been lost. These illustrations were key in clarifying what the Reformers really believed. 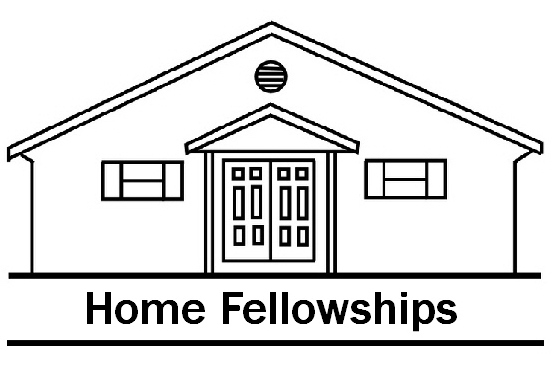 And, though the recent Neo-Calvinist movement parrots much of the Forum’s dialect and other illustrations to teach authentic Reformed doctrine, they avoid these illustrations like a plague. Why? Because these concepts are the most clarifying, and what was used to clarify can also be used to refute the same doctrine. I agree with the Forum, my illustration B and their Illustration C was the model that the church, for the most part, was teaching when the Australian Forum showed up in 1970 (Hereafter: AF). Don’t get me wrong, I don’t think the church was applying the model, but it is what they held to. They were actually functioning like model A and E.
Model A combines salvation with the Christian life. That may sound like a statement in regard to the obvious, but it really isn’t. When someone asks us if we are saved, we say yes, but the answer is in regard to models B and C. We were saved, so we are now saved. It was a onetime permanent act. Valerie, the family dog was born in the past, but her dogness is permanent. 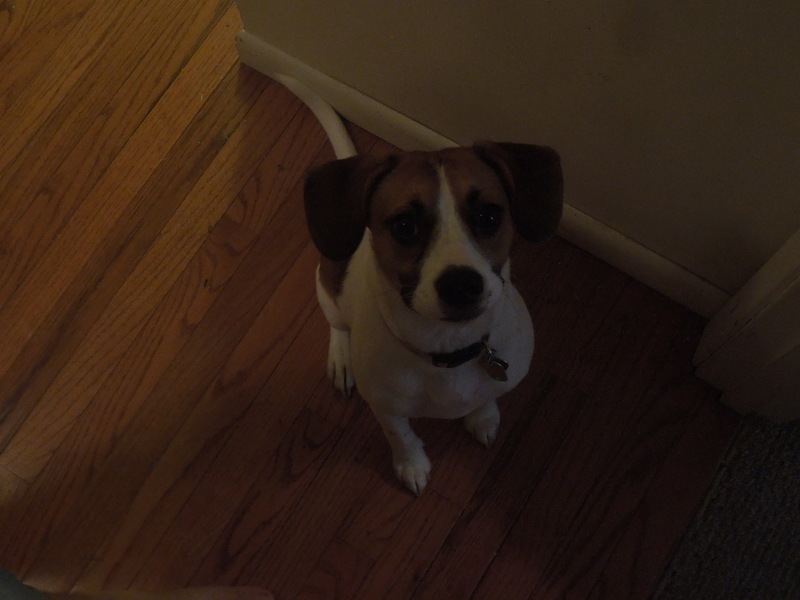 Valerie is not in the process of becoming a complete dog, she is a dog, she is perfect dogness. The AF would agree with my assessment here. Note in model C that justification is “finished.” When Valerie was born, her doghood was finished. Valerie will now start acting like a dog because that is her nature. I would also like to use their illustration to make a point. They, in representing the Reformed view take issue with justification being finished. 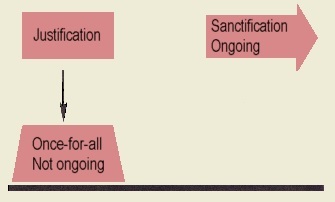 They believe it is ongoing, but look what they call it: “sanctification.” Why wouldn’t they call it “ongoing justification”? Normally, the term for the Christian life is progressive sanctification, but Reformed theologians stay well clear of the term progressive justification. The only exception is in the Calvin Institutes (3.14.title). 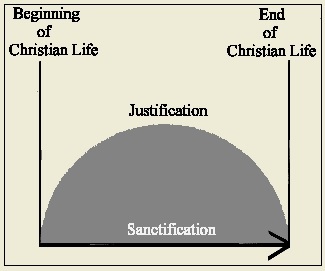 At issue is what they illustrate with model E—justification and sanctification are combined. Salvation is a progression and worse yet, we are in the midst of the progression. That means we can mess up the progression, this is an unavoidable inference, and is indeed an element of Reformed thinking. This is where I want to make a point about illustration D. The AF, like all of the Reformed, refutes this model as Christ plus something. Salvation only covers past sins, but we have to do something in our sanctification to maintain our righteous standing. 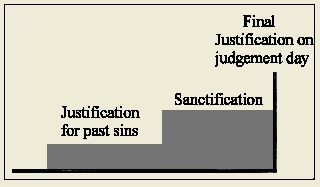 In both models justification (salvation) is not finished, but the Reformers say that is ok for their model because justification is finished by justification. But yet, this is the problem with all linear gospels like model A: we are in the middle of the process, so the question must be answered; “what is our role?” And that very question is a huge problem because mankind has NO role in being justified. No man other than Christ could pay the penalty for our sins. However, the Reformed answer is, “The Vital Union.” Basically, it is ok for us to be in the midst of the unfinished justification process because we participate in the same way that we were saved; viz, by faith alone. So models A, D, and E are the same thing, but the Reformed say that is ok for their model because it is Christ plus faith alone in Christ. In order to keep justification moving along properly, we must live our lives by faith alone. 1. The work itself is finished. You can’t do anything to finish a finished work. 2. You are not present to do anything. The work is not located in your realm of operation. This requires a discussion regarding the separation of justification and sanctification which is anathema to the Reformed thinker. 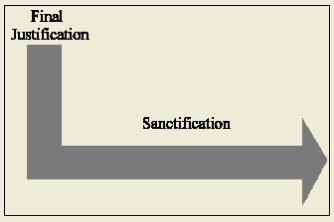 They say, “Justification and sanctification are never separate, but distinct.” However, because of the terms used by Scripture, the Reformers are forced to do something with sanctification, especially in light of 1Thess 4:3,4, so the progression of justification falls under the auspices of progressive sanctification. This brings us back to illustration F. If Valerie, a dog, specifically a beagle, is justification, why would we call her something different because she gets up and starts walking? Is that cause to call her a duck? Indeed, a Valerie sitting is “distinct” from Valerie walking, but does that make her something other than a dog? If Calvin himself spoke of justification as being progressive in the title of chapter 14 | book 3, and that in fact is what you deem it to be, why not call it progressive justification and be done with it? 3:2 – this only do I wish to learn from you—by works of law the Spirit did ye receive, or by the hearing of faith? 3:1 – O thoughtless Galatians, who did bewitch you, not to obey the truth—before whose eyes Jesus Christ was described before among you crucified? (YLT). Christ’s death on the cross finished the work of justification. But doesn’t Paul say that our salvation is future? The question is salvation from what? We know it is not salvation from sin that would condemn us for sin is not counted where there is no law (Rom 4:15, 5:13) and Christ put an end to the law (Rom 10:4). However, it is clear that the world will be judged by the law (Rom 3:19, 20). It is not salvation from sin that would condemn us. While the believer is born again and truly righteous, we must carry around the old us that was crucified with Christ. The things Christ died for are still with us (2Cor 4:7-18). As Christians, we await a deliverance from this body of death. (Rom 7:25). Clearly, salvation from condemnation is finished (Rom 8:34), salvation from the sin that condemns is past and complete, but there is left a salvation from sin that harasses us daily. 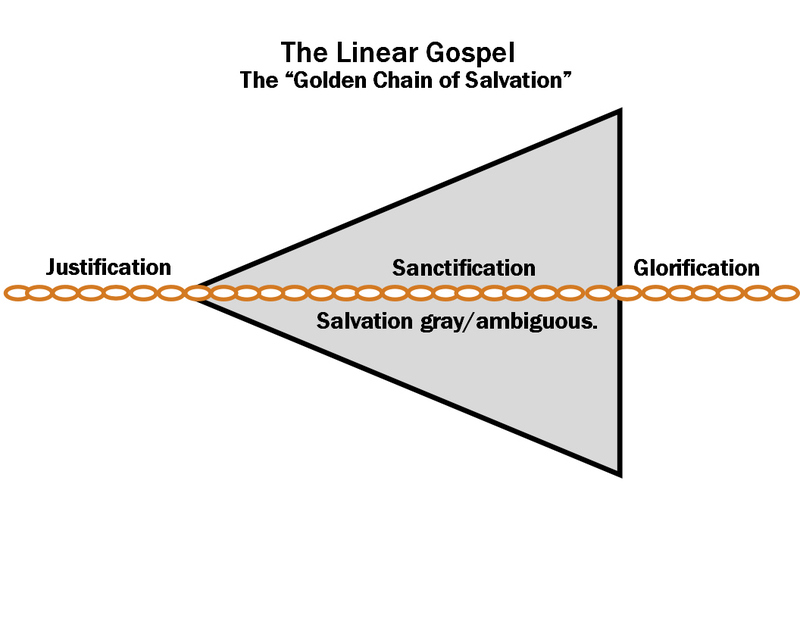 If the gospel is linear, and justification is not finished, Paul is speaking of a future salvation from condemnation—we reject that idea with prejudice, Paul is talking about the other salvation from the sin of our mortality. The Bible also refers to that as redemption. Remember last week and our discussion of the exchange of slavery? We were purchased from the other slave owner by the blood of Christ (1Cor 6:19,20, 7:22,23), and Christ will one day return to redeem His purchase (Gal 3:13, Luke 21:28). In the linear model, there can be no exchange of slavery because we are not finally free till the end. Neither is there an exchange of law because faith only is required to maintain the “vital union” that keeps our original justification moving forward. 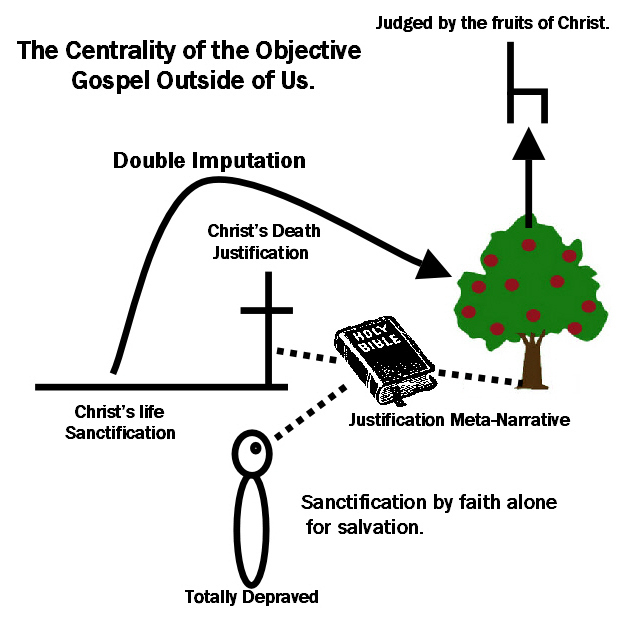 Moreover, if justification and sanctification are not separate, and are the same thing the Bible must be interpreted through the prism of justification only and in fact that is the very interpretive craze of our day; i.e., every verse in the Bible is about Jesus. Unfortunately, this would not explain the interpretive dichotomies of the Bible and would instead make them contradictions. There are many, many examples of this throughout the Bible, but the primary one is works. On the one hand, the Bible continually calls for faith alone without works, but on the other hand, it also calls for vigorous labor and obedience to the law. How can these be reconciled? Answer: some verses are talking about justification while others are talking about sanctification. If justification and sanctification are not separate, the Bible is nothing more than a book of confusion. The linear gospel also leads to all sorts of confusing doctrines that make doing nothing in our Christian life feasible. One is double imputation. This is the belief that Christ died for our justification and lived a perfect life of obedience for our sanctification. That way, Christ’s perfect obedience to the law is imputed to our Christian life as we live by faith alone. This Reformed doctrine also makes law the standard for justification in regard to Christians. Since perfect adherence to law remains the standard, but Christ fulfilled and keeps it for us, neither is an exchange of law needed in salvation as we discussed last week—the relationship to the law doesn’t change. First of all, this idea that we cannot command our feelings is something that I hear often and is not biblical. The apostle Paul instructed us to keep a clear conscience before God. Elsewhere, we find that our consciences either accuse us or excuse us. We all know how bad we feel when our consciences accuse us; therefore, we may assume that the opposite is true when we do right. We are also instructed by Paul as well to make it our goal to please God; certainly, a feeling of accomplishment can be expected here as well. Clearly, we can command our feelings by doing what is right. In contrast, the above dialogue is the result of the linear gospel where an act of grace must precede all feelings. Again, if we are in the middle of a process that saves us, and we are good Reformed thinkers with faith alone always in the forefront, we must only believe and merely be a witness to “grace.” Can you see this in the above dialogue? Only believe is the exhortation of the pastor, and we cannot command our feelings anyway. In contrast, this young man isn’t going feel any different UNTIL he makes a decision to follow Christ. Why? Because he is under judgment! When you are under law, all that awaits you is a fearful judgment under the law. Why would he feel any different until he is no longer under threat of judgment? This would have been my counsel to this young man. At the very least, the vacancy of fear and the knowledge that you are going to spend eternity in heaven will produce good feelings on some level. Yes, this leads into all kinds of Reformed wackiness that I believe shuts up the door of heaven to many. I myself know of a young man that wouldn’t make a commitment to Christ because he was yet to see Christ as a “treasure chest of joy.” This all speaks to the Reformed concern that man is able to make an intellectual decision that is part of the salvation process. Yea, we must have some kind of sign that we were enlightened first before we make the decision. But why would it be delight? What of a fear of judgment that we know we deserve? The fact that the aforementioned young man was vexed and in turmoil is a sure sign from heaven that he understand that he is under the law. Good grief! Lord come quickly and deliver us from this ignorance dressed in academic garb! Remember what we have learned previously in this Romans study? Our service to God is a what? Right, “reasonable service.” Remember what that word means? It means “rational.” My father was an intellectual who always had an interest in God throughout his whole life, but in the end, he assured me that he had made a personal commitment to Christ. But be sure of this, my dad would not have made a commitment to mystic nonsense coming from the Reformed crowd. The decision to be saved is a rational decision, and our service to Christ is rational. “Just believe” is no answer, we must tell people WHY they mustn’t wait on a feeling. It is because feelings follow thinking and doing. For the most part, feelings are a choice. What do you do if you feel unsafe? You make a decision to change your circumstance to something safer, and then you feel safer. My friends, this is hardly rocket science. What comfort is there in thinking that our “final justification” will be confirmed at some plenary judgment at the end of the age? We should take comfort in the fact that we will not stand in that judgment at all! And again, this points to the need for interpretation according to the following interpretive question: Is it a justification verse, or a sanctification verse? In the linear construct, it must always be a justification verse; either a sitting still dog or a walking dog that is apparently a duck because he is now walking. But in the parallel construct, I can point to numerous biblical dichotomies that are defined by parallelism. Let’s look at a couple. 21 Brother will deliver brother over to death, and the father his child, and children will rise against parents and have them put to death, 22 and you will be hated by all for my name’s sake. But the one who endures to the end will be saved. 23 When they persecute you in one town, flee to the next, for truly, I say to you, you will not have gone through all the towns of Israel before the Son of Man comes. What is Christ saying? He is saying that when you see certain things happen during the tribulation period, you will be able to save yourself from physical death by fleeing from town to town because the Lord’s return is near. He is talking about saving yourself from physical death, not eternal salvation. “Saved” has more than one meaning. In verse 11, Paul is talking about salvation from this present warfare against evil within and evil without. In the same way Christ stated that those who see certain things in the tribulation period draw near to their “redemption.” That word refers to a ransom that has already been paid on the cross. You were purchased and the sale if final. Christ did not purchase you on a Reformed installment plan. We wait for redemption when Christ comes to claim what He purchased.